WHEN the rest of the world turns up in Russia for the somewhat controversial World Cup in 2018, first-time visitors are going to have something of a cultural shock. In 2013, 27 million people visited Russia and despite the relatively frosty relationship between Vladimir Putin and the west, there’s still no shortage of visitors to a country that fascinates, infuriates and, ultimately, worries us all. The World Cup is being held in 11 cities: Moscow, St. Petersburg, Kaliningrad, Kazan, Nizhny Novograd, Samara, Volgograd, Saransk, Rostov-on-Don, Sochi and Yekaterinburg. The last of those, Yekaterinburg, is the most eastern location for the competition. Yekaterinburg is on the border of Europe and Asia, but it is Russia’s fourth largest city with a population of 1.5 million. It is the main industrial and cultural centre of the Ural Federal District.The city is of historic significance. It was in Yekaterinburg that Tsar Nicholas II, the last Emperor of Russia, was killed, along with his family, on July 18, 1918. There’s more. This is a city that once had an anthrax outbreak, caused by a leakage of something nasty from a military base, and in the 1960s, an American spy plane was shot down close to the city. The pilot, Gary Powers, was detained but eventually exchanged for Rudolf Abel, the KGB spy who was featured in the recent Tom Hanks movie, Bridge of Spies. Such landmarks make events like a football World Cup seem quite trivial, but Yekaterinburg will host four games in World Cup 2018, all to be played in the newly reconditioned Central Stadium. Although the stadium usually plays host to Russian top flight club, FC Ural Yekaterinburg, you don’t associate this place with football. The club was formed in 1930 and finished eighth in the Russian Premier last season. Their last home game, a 1-1 draw with Arsenal Tula, was watched by fewer than 7,000 people. FC Ural are one of the poorer supported sides in the Russian top flight. The city also seems to have a bit of a wacky side to it. A cement plant in the city is set to become home to a tower based on a castle from the popular TV series, Game of Thrones. Moreover, a group of anonymous artists have been transforming a spherical monument into a giant Pokeball from the Pokemon game. On the subject of one of Japan’s greatest exports, a Russian YouTuber is facing a jail sentence after he filmed himself playing Pokemon Go in a church in Yekaterinburg! The city is already looking forward to hosting the World Cup and a recent FIFA delegate inspected the progress of the stadium and other facilities. 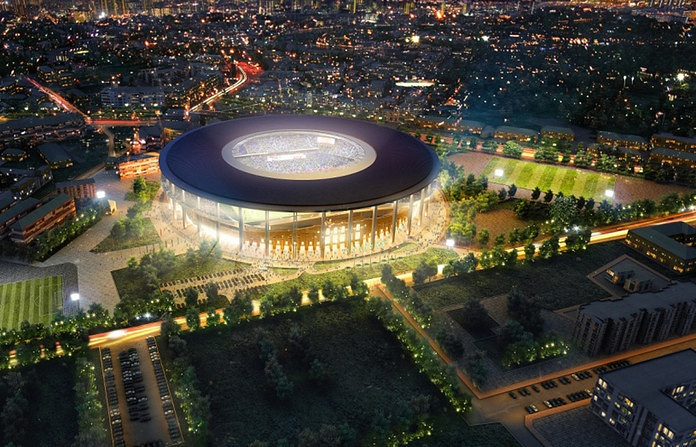 The stadium – a 35,000 capacity – will be completed by the end of 2017. A football academy accompanies the stadium development and local politicians and sporting folk are hoping that this will help nurture young talent – on the evidence of recent football tournaments, Russia could do with it. The local Koltosovo airport is also preparing for 2018. City officials believe that guests from Europe will be “pleasantly surprised” by what they see. Apparently, everything in Yekaterinburg is on plan – and that’s the official line from the good people of the Kremlin!